Although there has been little public acknowledgement, the Palestinian and Israeli forces have developed an elaborate system of detailed security cooperation. On rare occasions, when he is under pressure from the international community, Abbas has felt obligated to defend security cooperation with Israel as a necessity because it serves "the Palestinian national interest". Even then, he is defensive. In a speech to the Organization of Islamic Cooperation on June 18, 2014, he said, "We don't want to go back to chaos and destruction, as we did in the second [Palestinian] intifadah. I say it openly and frankly. We will not go back to an uprising that will destroy us." He used another formulation in 2010, "We are not Israel's security guards. We are partners. 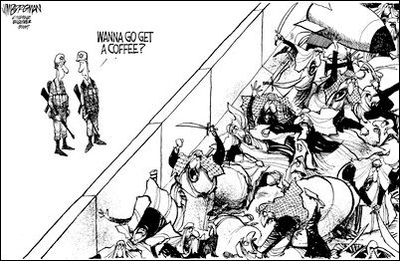 If they want us to cooperate, then we stand ready to do that within the limits of our national interests." And he waxes almost enthusiastic when he assures Jewish leaders, as he did on May 31, 2014: "The security relationship [with Israel]…and I say it on air, security coordination is sacred, sacred. And we will continue it whether we disagree or agree over policy." Under this pressure, in recent months Abbas has been making a series of threats against Israel, even including the idea that he will terminate the security cooperation with Israel if his political demands are not met. 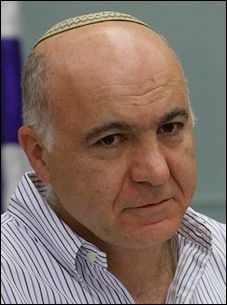 On August 21, 2014, he said that he had told Israeli Shin Bet chief Yoram Cohen, "If [the U.S.] does not agree [to Palestinian demands], we will stop security coordination and cooperation with Israel," and repeated the threat publicly in a press briefing at his Ramallah office on October 1, 2014 . 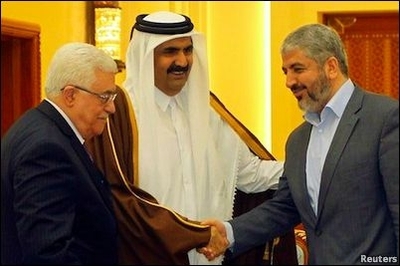 PA President Mahmoud Abbas (left) meets with the Hamas political bureau chief Khaled Mashaal (right) in Qatar under the auspices of its emir, Sheikh Hamad bin Khalifa Al Thani, July 20, 2014. While reduced intelligence could be harmful to Israel, for Mahmoud Abbas and the Palestinian Authority it could be fatal.